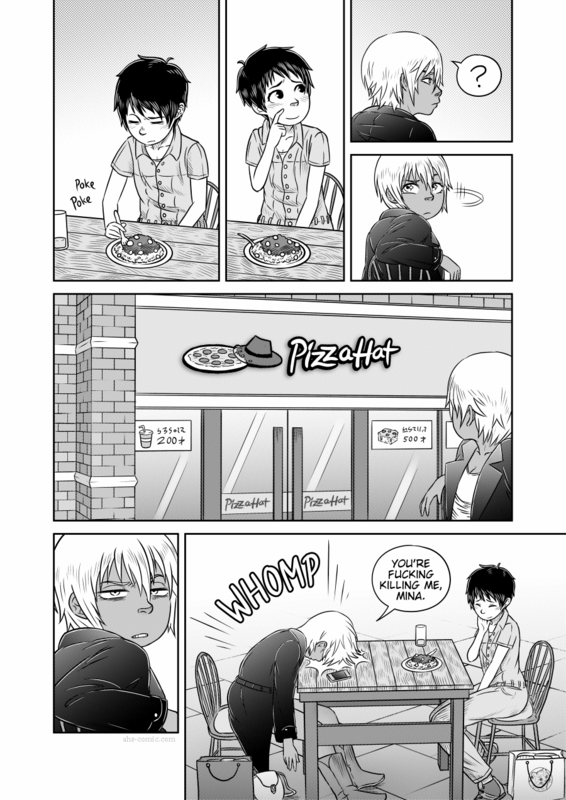 PizzaHat!! I love it!! You slay me!! And by the way, great job telling the whole gag silently… really, you could have left out Erin’s words completely, the action says everything. Great job illustrating this. Multinationals. Now you can visit the whole world without ever having to be subjected to foreign culture. Heh heh, I had to read it twice before I realized that it wasn’t the real-world brand. Next time Mina thinks she doesn’t look good or looks lie a boy, please show her the last panel. I really like the last panel, especially how cute Mina looks. You continue to do a great job with this comic! Thanks for creating it. Oh, I have had pizza in Japan. My favorite was the beef and red potato pizza that had a sort of mayonnaise sauce rather than tomato sauce. It wasn’t Pizza Hat though, it was ShakeZZZ. Your comic section became weird, by the way. Pretty sure that’s just you. Something similar happened to me one time. I think there may be something in the page code that causes browsers to go a little cranky from time to time. Gah, derp, that should say “comment section”. Anyway, who’s the guy onstage in the picture, anyone know? I don’t have a clue who the guy onstage in the picture was, though. WHEN DID SHE GET SO INFURIANTINGLY CUTE?! So, when are we going to get to the point where Mina starts to turn into an alien? Sorry but this is being dragged out too long.